Shankarpali: Shankarpali (or shankarpaale) is a snack popular in Maharashtra, India. 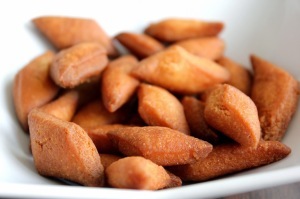 It is traditionally enjoyed as a treat on the Diwali holiday. Shankarpali is made from dough of milk, sugar, ghee, maida, semolina and salt. Shankarpali are slightly flaky, melt in the mouth crisp fried flour cookies are a good tea time snack and popular in western India. Powder the sugar in a dry grinder. Sieve the flour with salt. Mix flour-salt mixture with powdered sugar. Add in the semolina to the flour mixture. Add in the melted ghee to the flour-semolina-sugar mixture. Mix with hand, to make a breadcrumb like consistency. Add a tablespoon of the warm milk in intervals and knead the flour mixture to firm tight dough. If the dough looks dry, then add 1 teaspoon milk and knead. Rest the dough, covered, for 20-30 minutes. Heat the oil for deep frying in a kadai or pan, on medium heat. Roll each part into a disc 6-7 inches in diameter. Cut diamond slices (shapes can be accoutring to your preference) from the rolled dough. Gently drop 6-8 of these slices into the hot oil. Fry till the shankarpali are golden coloured. Drain the excess oil on kitchen paper napkins. Shankarpali are ready to be served. Serve the shankarpali at room temperature. If you have any queries regarding the Shankarpali recipe, please leave a comment.